I find the process of diplomacy fascinating. I watched the recent summit between the president of the United States and the leader of South Korea with interest. Perhaps even more interesting were the glimpses we had of all the work behind the scenes that led to that historic face-to-face meeting. One of the people who has worked behind the scenes for a long time is New Mexico’s former governor Bill Richardson. Of course, before he was governor of the state I call home, he had been a congressman, ambassador to the United Nations, and Secretary of the Department of Energy. My latest novel, Owl Riders is largely a reflection of my interest in diplomacy. A lot of books, especially in the science fiction and fantasy genres, are about wars and fighting. That certainly can make for exciting reading, but I’ve long believed there can be a lot of tension and suspense in stories about the people who struggle to keep conflicts from blossoming into full-scale wars. Ramon Morales, one of the protagonists of my Clockwork Legion series, was created as a man of action. When we meet him, he’s sheriff of Socorro, New Mexico, but he’s not altogether happy with his lot. The city has been changing and most of the people he knew growing up have moved away. He’s also tired of breaking up fights and facing angry people with guns. I introduced him to the series’ other protagonist, Fatemeh Karimi. She’s a healer fleeing injustice. She sees the process of making peace as a kind of healing. Initially, Ramon was inspired by real life lawman Elfego Baca, who was quite a character in New Mexico history. He gained fame when he kept several Texans from breaking their compatriot out of the local jail in a gunfight. After being sheriff of Socorro, Baca went on to be an attorney. Unlike Ramon, Baca never really had a diplomatic career. The closest he came was when he served as counsel to General Huerta during the Mexican Revolution. Apparently this resulted in Pancho Villa putting a price on Baca’s head! Early in the Clockwork Legion novels, Ramon and Fatemeh encounter a microscopic alien swarm that calls itself Legion. Because it’s microscopic, no one can see it or touch it, but it can communicate with people directly through their brains and it can communicate with several people at the same time. This ultimately proves to be an advantage when Ramon is first making his reputation as a negotiator. Legion helps him see and understand things about the other parties that no one else can. In Owl Riders, Ramon’s career is on a track similar to that of Elfego Baca, or even Bill Richardson. He has gained his Juris Doctorate. He’s working as an Assistant U.S. Attorney in Louisiana when he’s called in to settle an Apache uprising in Arizona. The challenge for Ramon is that Legion is long gone and now he has to do this himself. What’s more, Fatemeh has been taken captive by a man from her past. Will Ramon be able to save the woman he loves and successfully negotiate peace without extraterrestrial intervention? I hope you’ll join me on the pages of Owl Riders to find out. 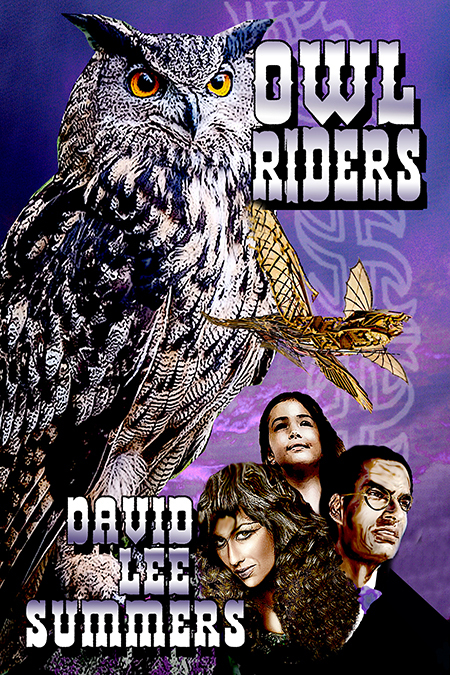 You can learn more about Owl Riders, read a sample chapter, and find out where to order at: http://www.davidleesummers.com/owl_riders.html.